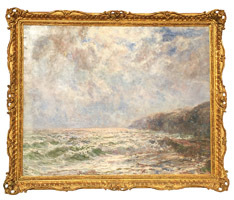 John Falconer Slater (British, 1857-1937) Large Oil on Canvas "Rough Coastal Seascape" depicting a marine British coastal scene on a cloudy day with rough a seas. Signed: Slater (Lower left) within an ornate giltwood carved frame, circa: 1890-1900. John Falconer Slater was a British artist, born at Rye Hill, Newcastle-upon-Tyne. 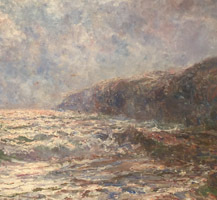 He was a Northumbrian painter of landscapes, seascapes and portraits with a distinct dynamic impressionist style who mainly exhibited in his own area. 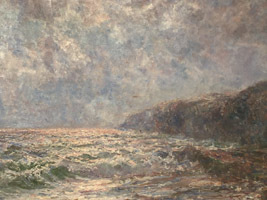 Slater was particularly good at depicting wild water and often painted the many moods North Sea on the shores of where he lived. He could very well be one of the best Northern Impressionist artists. 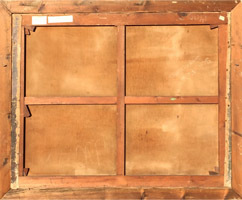 Before becoming an artist John Falconar Slater worked as a book-keeper for his father, Thomas, in his corn mill and later lived in South Africa for a period where he ran a store in the diamond fields. Once established as an artist he practiced in the region of his homeland, Northumbria. In 1889 one of his pictures was accepted by the Royal Academy and later he was recognised by the Royal Scottish Academy. He continued to exhibit locally throughout his career. The last twelve years of his life were spent in Cullercoats and widely on Tyneside. Works by John Falconer Slater at Museums, Venues and Exhibits: Bank of England Museum. CultureNL. Darlington Library. Durham University. British Government Art Collection. Laing Art Gallery. 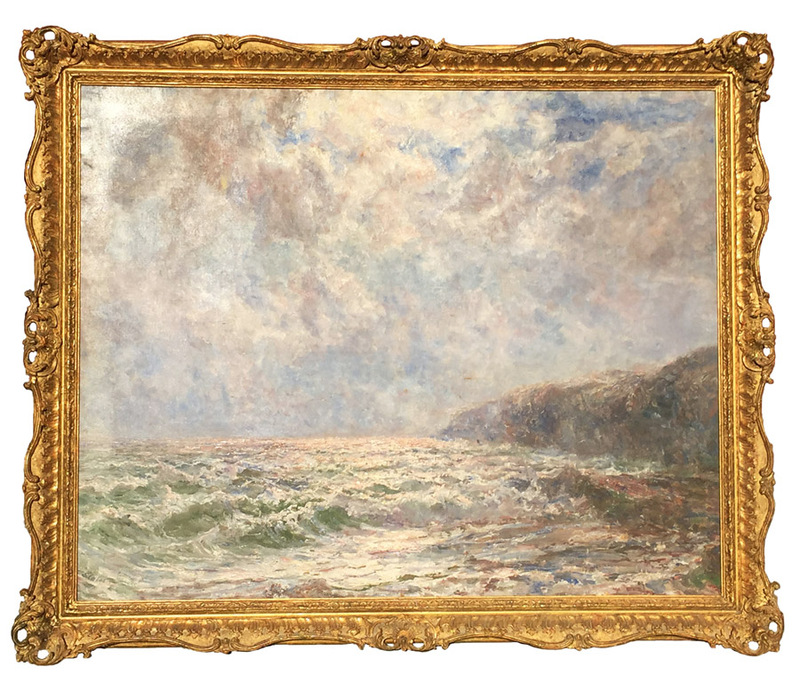 John Falconer Slater (British, 1857-1937) Large Oil on Canvas "Rough Coastal Seascape" depicting a marine British coastal scene on a cloudy day with rough a seas. 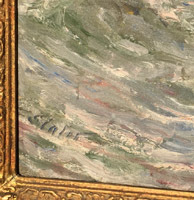 Signed: Slater (Lower left) within an ornate giltwood carved frame, circa: 1890-1900. Exhibited: Royal Academy and widely on Tyneside. John Falconer Slater was a British artist, born at Rye Hill, Newcastle-upon-Tyne. He was a Northumbrian painter of landscapes, seascapes and portraits with a distinct dynamic impressionist style who mainly exhibited in his own area. 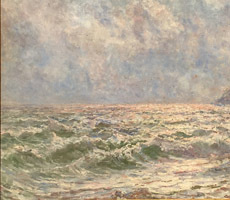 Slater was particularly good at depicting wild water and often painted the many moods North Sea on the shores of where he lived. He could very well be one of the best Northern Impressionist artists. 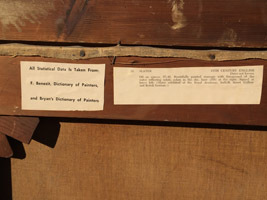 Before becoming an artist John Falconar Slater worked as a book-keeper for his father, Thomas, in his corn mill and later lived in South Africa for a period where he ran a store in the diamond fields. Once established as an artist he practiced in the region of his homeland, Northumbria. In 1889 one of his pictures was accepted by the Royal Academy and later he was recognised by the Royal Scottish Academy. He continued to exhibit locally throughout his career. The last twelve years of his life were spent in Cullercoats and widely on Tyneside. South Shields Museum and Art Gallery. Sunderland Museum & Winter Garden.